Is “pitch diameter” the same as the distance between the centers? 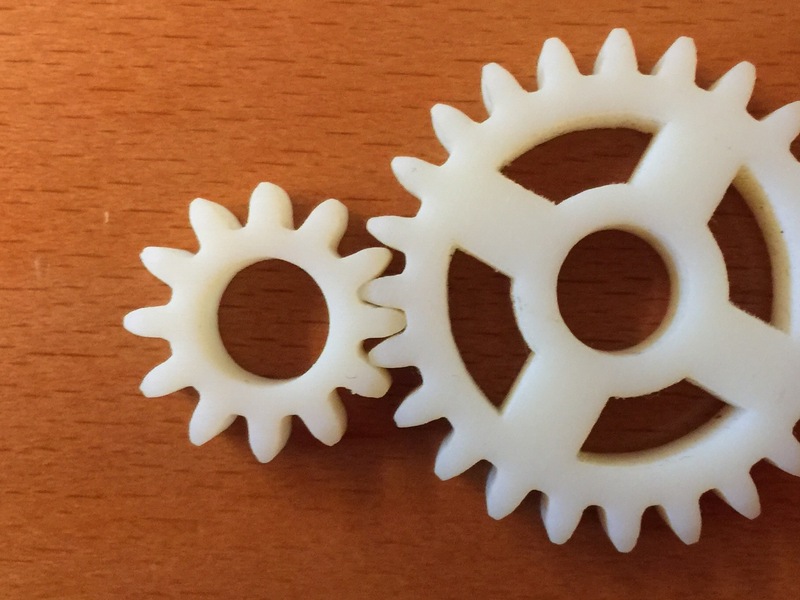 I am designing gears in FreeCad, and printing then on a FlashForge Finder. 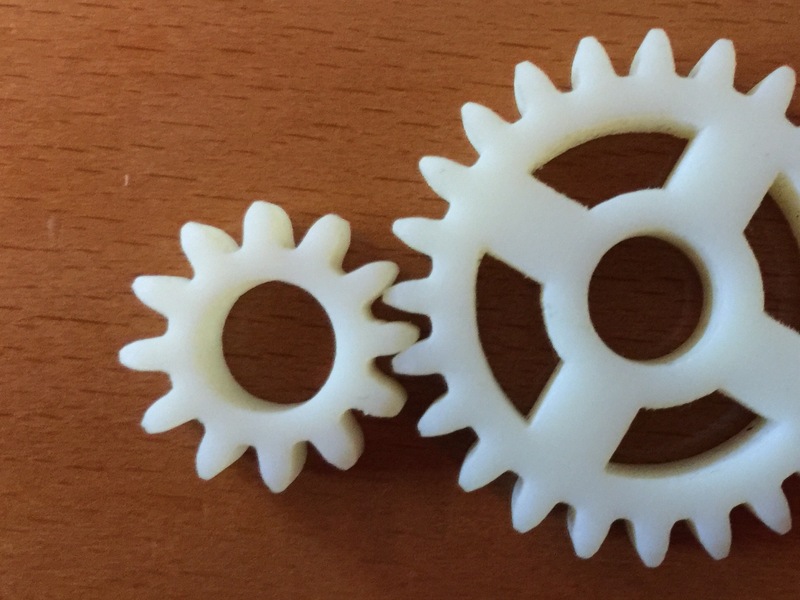 I want to know if the pitch diameter is the same as the distance between the centers of the two gears. 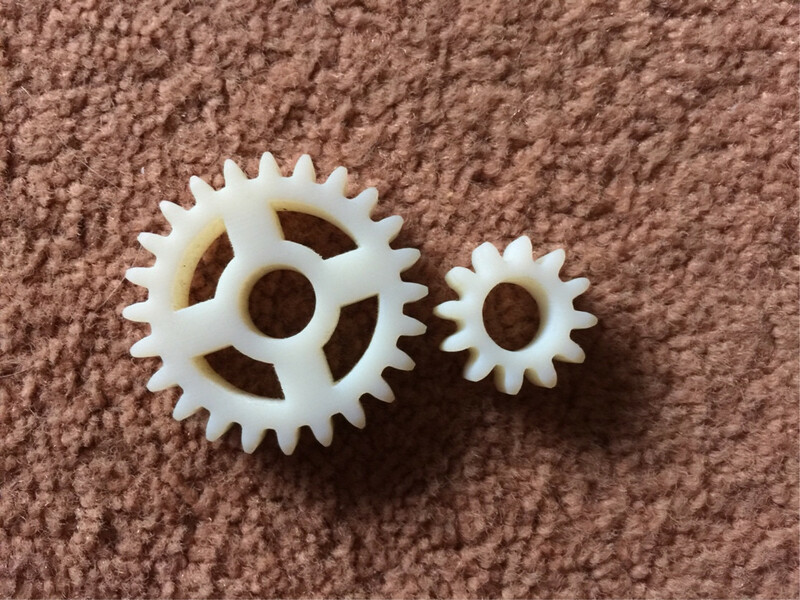 Both gears are external spur gears. This question came from our site for 3D printing enthusiasts. If the gears are identical ($d_1 = d_2$), then the pitch diameter is, indeed, the same as the distance between the two gear centers, $C$. Otherwise, is it not. The standard reference pitch diameter is the diameter of the standard pitch circle. 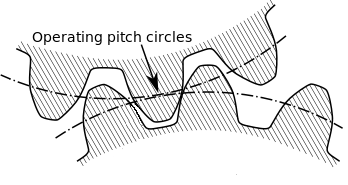 In spur and helical gears, unless otherwise specified, the standard pitch diameter is related to the number of teeth and the standard transverse pitch. The diameter can be roughly estimated by taking the average of the diameter measuring the tips of the gear teeth and the base of the gear teeth. 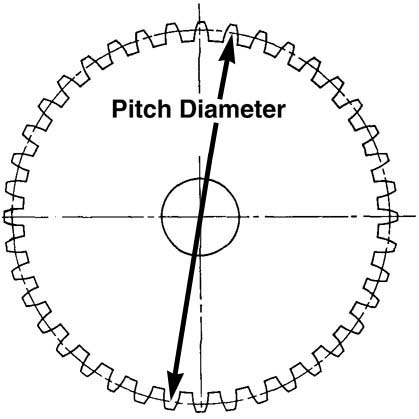 The pitch diameter is useful in determining the spacing between gear centers because proper spacing of gears implies tangent pitch circles. The pitch diameters of two gears may be used to calculate the gear ratio in the same way the number of teeth is used. Where $N$ is the total number of teeth, $p$ is the circular pitch, and $P_d$ is the diametrical pitch. As indeed answered by Greenonline, the centre distance is the average of the pitch diameters of the two meshing gears, but this is only strictly true when the gears are operating at standard centre distances, i.e. where the pitch circles are tangent to one another. 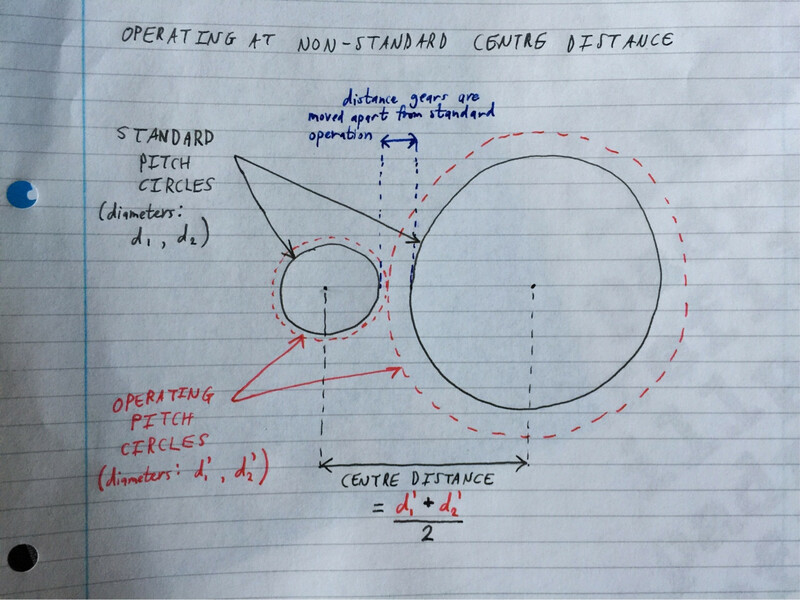 There are indeed cases where two gears can be operating at non-standard centre distances, and therefore the standard pitch circles are no longer tangent to one another. Sometimes non-standard centre distances are accidental and occur due to difficulty in exactly aligning two gears to have a standard centre distance. Other times it may be a deliberate part of the design. 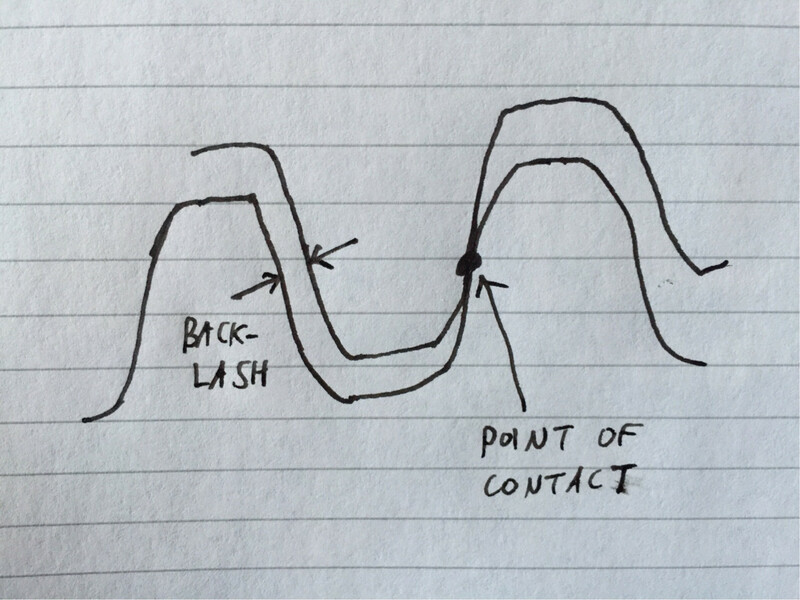 For example, slightly increasing the centre distance above the standard value will implement some backlash (as shown below) which helps to prevent any jamming from occurring. Most gears in industry have teeth that are involute (the notable exception to this is in the clockmaking industry, where teeth are frequently cycloidal instead), and the advantage of involute teeth is that gears can still operate smoothly at non-standard centre distances. Where $N$ is the number of teeth, $m$ is the module (a measure of tooth size in millimetres), $P_D$ is the diametral pitch (a measure of tooth fineness in teeth per inches) and the subscripts 1 and 2 indicate which gear the variable refers to. This is the dimension that is provided when buying gears "off the shelf". Taking the average of these diameters for both gears will give you the standard centre distance, which may or may not be equal to the actual centre distance. Where $C$ is the standard operating distance. 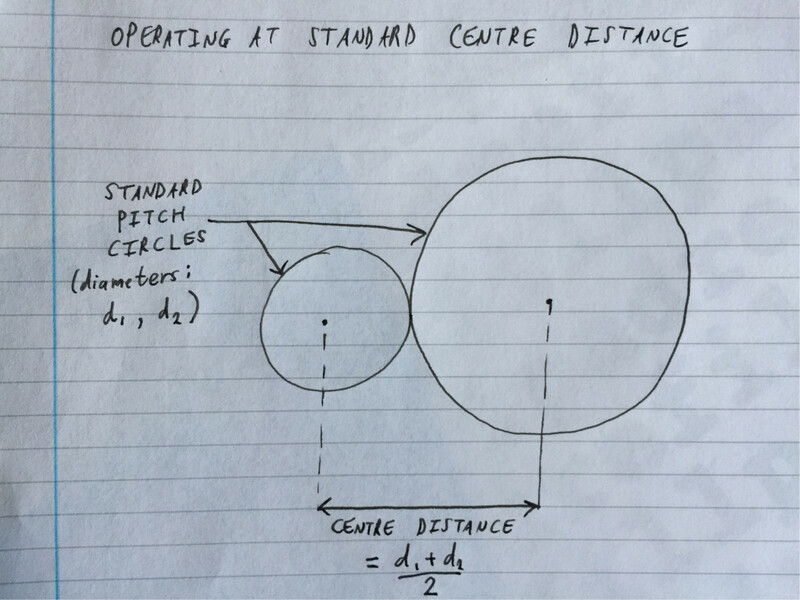 Where $d'$ is the operating pitch diameter, and $C'$ is the (actual) operating centre distance. Yes they should, in theory, and for most practical purposes be the same. The pitch circle diameter is the effective radius of a gear in terms of torque, although for some tooth profiles this may be a mean value. In practice gear design often uses the module system which defines gear ratios by number of teeth for a given tooth profile and ensures that you always have an integer number of teeth and eliminates pi, making calculations more convenient.